Samsung is again at the forefront of the mobile technology. 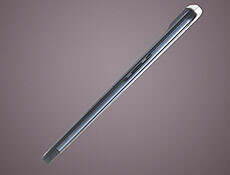 Recently they unveiled an ultra-slim mobile handset, called u100, which is 5.9mm thin. Sometime ago we had covered Sony’s attack into the mobile phone market with 8 new mobile phones (read here). It looks like the South Korean electronics manufacturer was not quite happy with that and decided to respond adequately. Samsung, in fact, announced not only the slimmest phone in the world by also 5 more models. The first two are new models of the Ultra II line, and the other three are included on the Ultra Special series, focused on multimedia functionalities. Most of the announced models will be available as soon as the next month, but there are no details about the price.